Variety is a big part of my diet. In the three years I worked as a personal chef, I only repeated recipes a handful of times, and those were requests. I figure I love food and love to eat and I want to make as many different things as I can in my lifetime. Of course, I have my go-to meals but I really do try and have variety in our food lives. And then there are the things that I could eat every single day and be totally happy. Good french fries with ketchup. Noodle soups like this one, noodle dishes like this one (yes, I have a thing for Asian noodles) could fulfill me until the end of my days. And any kind of red lentil dish is on that list too. If you have never cooked with red lentils, you are in for a treat. They are among the fastest cooking of beans and they change utterly and completely from raw to cooked. Raw they are bright orange (in spite of their name) and look like flat pebbles. Cooked they become a mellow yellow and they lose their shape. Depending on how much liquid is in your dish, they can loosely resemble other lentils, or they can disappear completely. They, like other lentils, are high in protein and fiber, yet low in calories and fat. They require no pre-soaking time. On Thursday, I crossed the Sound and did a cooking lesson for a group of extraordinary women. We have been talking about doing a class for months and I gave serious thought to what I wanted to cook. In the end, I decided to make a full meal and it took me about one second to decide to feature a red lentil dhal. Because I love red lentils and I love this family of spices, I have made various incarnations of this dish many times over the years. Of all the ones I have made, this is my favorite. It is very highly spiced – not hot, just spicy. One of the beauties of this dish is its adaptability. You could add all manner of vegetables (carrots, potatoes, zucchini, spinach come to mind). Or you could add more liquid, allow it to simmer away and turn it into a soup. This list of ingredients is long but much of it is spices. The stew actually comes together quite quickly. Heat just enough oil to coat the bottom of a large pan and add the mustard and cumin seeds. Be careful as they will begin to pop. Immediately add the onion, adjust the heat to medium, and cook until softened – about five minutes. Add the ginger, garlic, chile, curry powder, cumin, tumeric, and chile powder and fry for 3 minutes. Add the tomato paste and fry for 1 minute. Add the lentils and stir to coat with the oil and spices. Add the cinnamon stick, water, and coconut milk. Bring to a boil, then reduce the heat so the dhal is at a simmer. Cover partially and cook, stirring occasionally so it doesn’t stick to the bottom, until the lentils have partially lost their shape and are soft – about 15 minutes. Stir in more liquid as necessary for the consistency you want. Remove from the heat, season with sea salt and add the lemon juice to taste. At this point, you can allow the dhal to cool and then cover and refrigerate it overnight. When reheating on the stove, you will need to add more liquid as it will thicken as it sits. About 10 minutes before serving, add the herbs. You will want them to cook down a bit but not so much that they lose their color. Serve warm over basmati rice and with a raita if desired. we loved your Curried Red Lentil Stew so i can’t wait to try this one! would it work to use cinnamon powder instead of a cinnamon stick? if so, how much would you need? also, i don’t believe i have mustard seeds. is that a must or is there a substitution? yum! can’t wait to try this. the tomato puree is just like pureed tomatoes? not tomato paste? this is the kind of recipe i need on a cold rainy day like this. 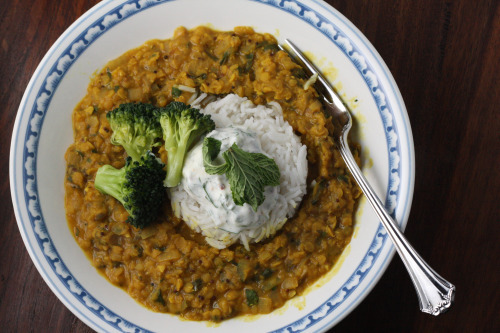 The fact that you used light coconut milk in this particular lentil preparation makes me heart this recipe even more. Thank you very much for the lentils lesson! I now can say I know something about red lentils. They look and sound delicious. The taste is right up my alley! P.S. Great blog! Wonderful dish. I am a huge fan of lentils. I can’t wait to try this one. yum…..I am going to give this a try tomorrow! Oh yum!! I’m going to make this tonight! I made your chili last week and it was a BIG hit! Even with our 15-month old baby boy! variety is the spice of life and i love all the spices involved with your dish. we are HUGE lentil fans here, but i have yet to try the red. they are now on my list. the only issue with a dish like dahl is that i usually can’t stop myself from a second (or third) helping!! This sounds really good. I recently made the switch to eating vegetarian and am trying to figure it all out. My first attempt at red lentils didn’t go so well, but I will try this. Nice to reconnect again (you found me on Facebook)! I eat so many lentils and I love how quick the red ones cook. The other night I also made a dal but with yellow split peas. Your photo looks beautiful and it’s hard to make lentils look good! Red lentils are such a good comfort food. They cook so quickly and go so well with lots of spices. This looks fantastic with the raita! I have been on such a lentil kick recently! I will def be trying this! I could eat lentils everyday too- that and chickpeas go into many, many of my meals! This recipe looks wonderful! I can’t wait to try it out. I’m with you – I always want to try out new recipes and don’t often make the same things again. 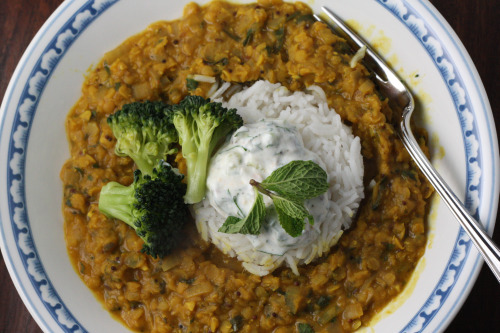 This lentil dish looks delicious! I love how red lentils fall apart when cooked. And I love all the spices, though I’m a bit wary of cinnamon in savoury dishes. Hi Dana – I tried this recipe the other night – it is fantastic! My husband and I loved it. It keeps really well, and the leftovers are even better. Thanks so much! This is the second time I’ve made this recipe and it’s just wonderful! This time I used half French green lentils and half red lentils, plus added finely chopped carrots with the onions and cubed potatoes and spinach with the liquids. Yum! Thanks so much for your WONDERFUL blog! made this tonight. I was short on time and had almost everything on hand. Used full fat coconut milk since it’s all I had. It was divine. My love affair with red lentils has begun. Many thanks! Dana- I made this last night and it is definitely one of the best lentil recipes I’ve made. I thought it was really divine. Thanks!! this was great! i think it could use just a tad more coconut milk i like it creamy and a touch of spice. But it was great and now i know what modifications to make to my liking. thank you! I made this tonight and it was wonderful! I didn’t have cumin seeds so I just added extra ground cumin. Otherwise, I made it exactly as indicated and it came out great. I served it with brown rice and a quick raita made with Greek yogurt, more parsley and mint, and chopped green onion. I will definitely be making this again. Quick & healthy & delicious!